LOGANBERRY, THORNLESS LY 654 (Rubus x loganobaccus LY 654). Fruit. 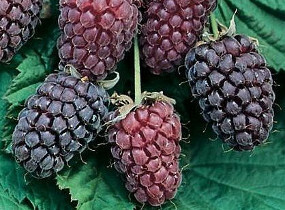 Hybrid between Blackberry and Raspberry with very large, cone-shaped burgundy-red berries up to 2ins (5cm) long, with sharp, distinctive, delicious flavour. Very high yields, good for eating raw, cooking or freezing. Self-fertile. Plant 8ft (2.4m) apart.